Friday Forum took on a lot of important topics over the last few weeks. We discussed how to support immigrants in this tense environment, family-centered policies that can improve outcomes for low-income families, the direction of Multnomah County government, and the state of local news at a time when large news organizations are struggling. Read below and listen in. February 23, we heard from Chanpone Sinlapasai, an immigration attorney who has represented hundreds of immigrants, and Juan Carlos Navarro, a graduate student who immigrated from Mexico as a child. They discussed current immigration policies and the threats immigrants face in this heightened anti-immigrant environment. You can listen to the full Friday Forum at XRAY.fm or watch it on YouTube. 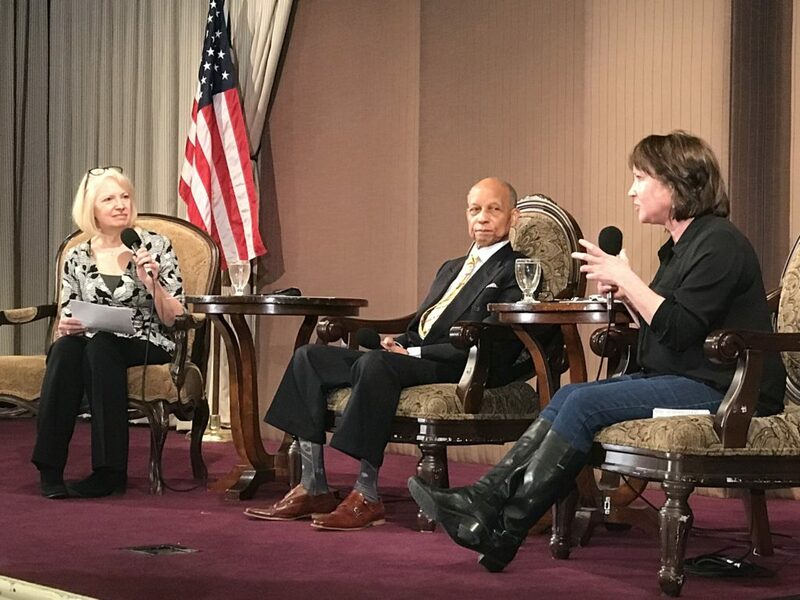 March 2, a panel of child and parent advocates spoke about how the way school and work are organized put an incredible strain on parents and children. The panel included Andrea Paluso from Family Forward Oregon, Carmen Rubio from Latino Network, and Donna Schnitker from the Oregon Head Start Association. On March 16, Multnomah County Chair Deborah Kafoury spoke to a City Club audience of more than 400 at Reynolds High School in Troutdale as part of her annual State of the County address. The speech began with Chair Kafoury’s recollection of her first day on the job—the same day a shooter killed two at that same school. Kafoury addressed gun control, wildfires, affordable housing, mental health, opioid addiction, youth employment, the Wapato Jail, and more. You can watch to the full Friday Forum on YouTube. Who writes the news and how it gets to us is a critical question that mainstream America has only recently begun to consider. On March 23, we spoke with Bernie Foster, the publisher of The Skanner News, and Joanne Zuhl, the executive editor of Street Roots. They talked about how they began and how they try to represent voices that over go unheard. Everyone is welcome to attend Friday Forum in person. Check out what’s coming up on our events calendar. If you cannot attend, you can always watch a live-stream of the event at www.pdxcityclub.org/live.